Cannot upgrade to High Sierra: Unable to unmount volume for repair? I've downloaded the High Sierra installer from the App Store and can confirm it's good and works. I did an install to an empty FW drive I have on hand and was able to complete the clean install and boot from that drive just fine. I've tried a plain old upgrade. Running the installer Macintosh HD as you normally would. This results in the above error message. I've booted the FW drive, force-unmounted the internal Macintosh HD volume and successfully run an First Aid scan on the drive from Disk Utility. No problems were found; green health check. I've tried making an external upgrade drive. Following the instructions here. This drive successfully boots to the recovery screen and from there I can select an upgrade option. However, once the installation reboots the computer I get the same warning. I'm kind of at a loss for how to continue here. Is it the Fusion drive that's causing the problem? My understanding is you can install High Sierra on a Fusion drive just fine and the installer will leave HFS+ alone on the drive and not force an upgrade to APFS. Why would the installer think there's a disk issue when Disk Utility says there is not? How can I get more information about the problem? How can I get the system upgraded to High Sierra? To do this I did a manual Time Machine backup than deleted and restored a file I care about. Where /Volumes/Untitled should be replaced with the name of your USB thumb drive. I used an older 500GB LaCie I keep kicking around for just these cases. It's fast and built well so I can trust it. Use the attached thumb drive to run the High Sierra installer. When asked which drive to install the operating system on to, click the Show More Devices button and select that USB hard drive. The installation should proceed without a problem and when the computer reboots you'll be booted from the remote drive and dropped into High Sierra. You can skip the first boot setup. You won't be using this for very long. Just make a temp account and get to logging in. You should replace /dev/disk2 in the above command with whatever your disk number is for your fusion drive. With the drive wiped you can proceed to install High Sierra on it using the USB thumb drive you turned into a bootable, High Sierra installation drive. Same as before, run the High Sierra installer from the thumb drive and when it asks you which disk to target select Show More Devices and find your fusion drive in the list. The installation should proceed without a problem now and when your machine reboots you'll be booted from the internal drive. You'll have to pick your region, connect your keyboard and mouse, and then setup WiFi. Once that is done the first boot process will give you the option to restore the computer from a Time Machine backup. Select this option. Select everything on the backup that you want restored and follow the prompts. Once the restore is complete you should have a functioning High Sierra installation with all your data and user accounts on it. Not the answer you're looking for? Browse other questions tagged hard-drive disk-utility install upgrade high-sierra . 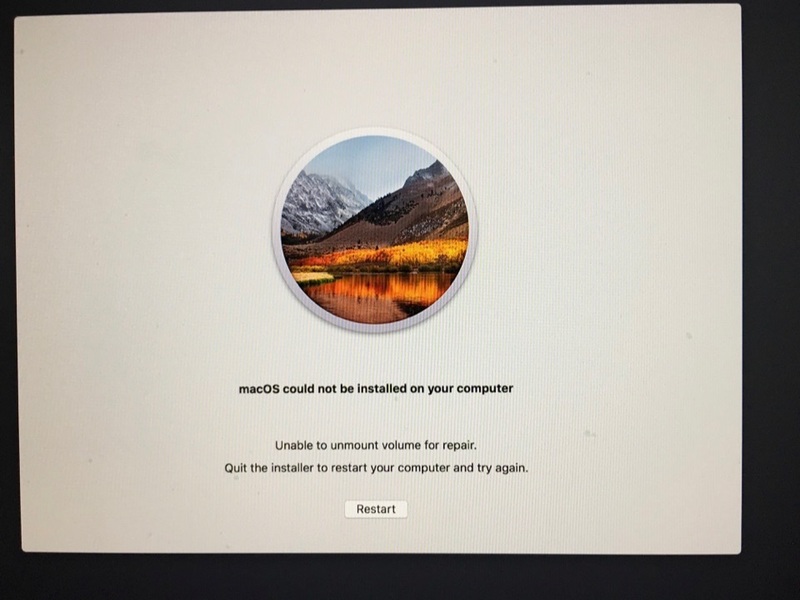 Failed upgrade from macOS Sierra to High Sierra on late 2010 MacBook Pro 15"
Terminal command to force-install Mac OS High Sierra onto a specified drive?